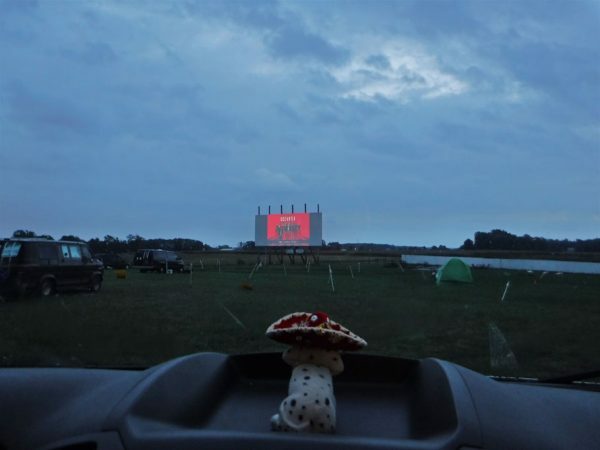 Pulling into the Field of Dreams Drive-in Bob is pretty excited about seeing Antman. September 24 – 26, 2018. The skies were gloomy as we navigated down rural roads in northwest Ohio on our way to the gathering. We passed an old mill, trees, a few houses, and farms. After rounding our last turn we saw a large cornfield and then a portable marquee sign advertising the movies Jurassic World & Antman. “Turn around,” I told Greg, “we just passed it.” We turned at the sign and drove up to the ticket booth in the middle of nowhere with our admission already in hand. 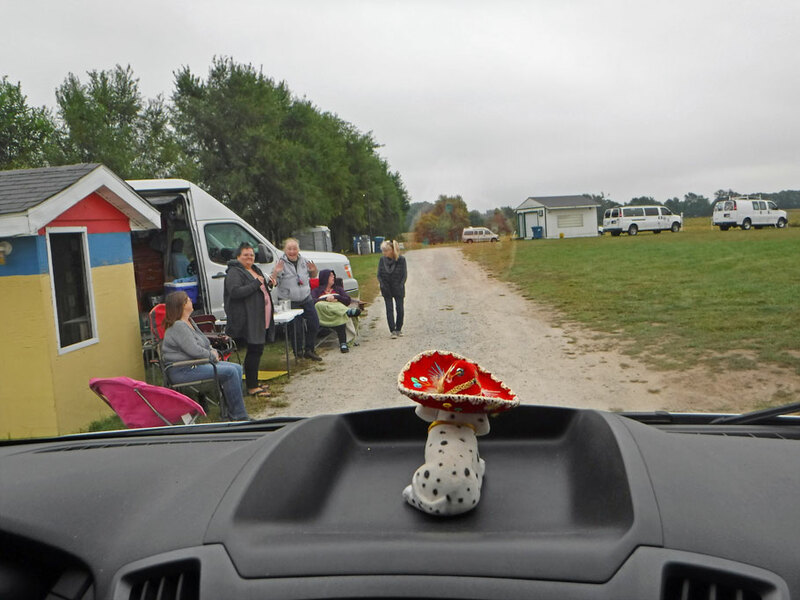 We had arrived at the Field of Dreams Drive-in theater and the GVN camp-in meet up. We have only been to one other van meet up before, the Rubber Tramp Rendezvous, a couple of years ago in Arizona. Reportedly there were over 7000 attendees at that event. 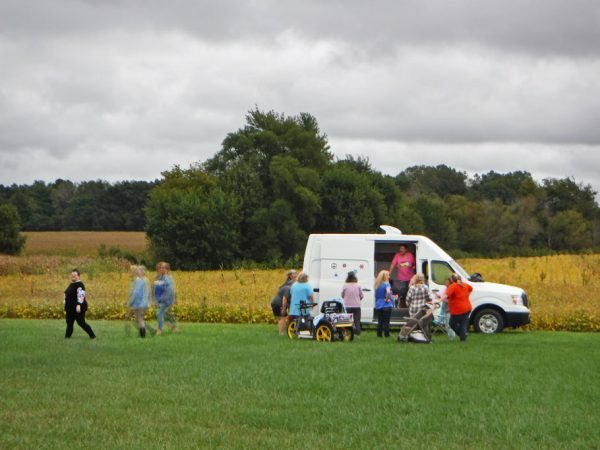 The GVN meet up was much much much smaller – about 30 vans. 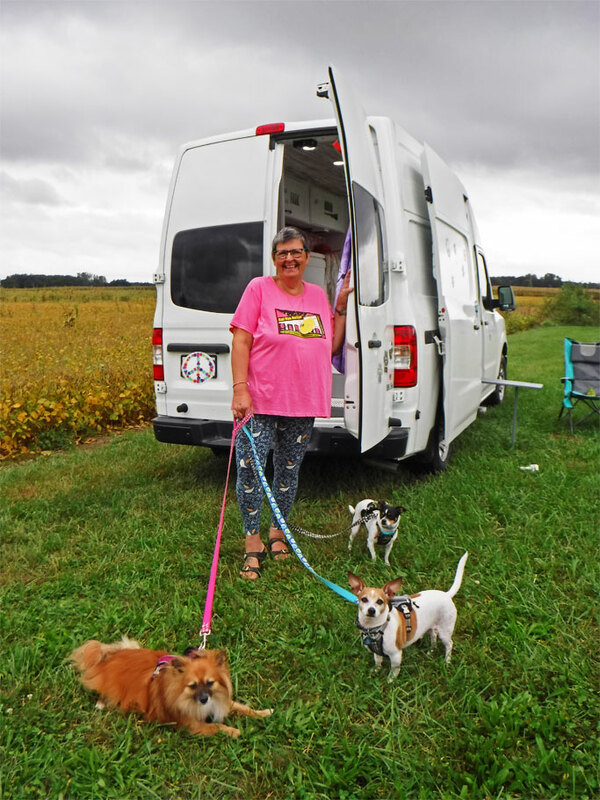 It was the brainchild of Marty, group leader and sole admin for a women’s van Facebook group. We are going to call this group GVN because honestly I am not supposed to advertise the group. It is a somewhat of a secret and a tab bit exclusive. Not that the group is all elitist or anything like that – I mean who ever heard of an elitist who lived in a van (I jest because oddly enough, they are out there)? It is just that it is Marty’s group and she wants a small (no more than 300 members) intimate space for women vanners where everyone can get to know one another and everyone contributes. There is actually a requirement to contribute a post (not a comment) once every 6 months in order to be considered active and stay in the group. After showing our tickets to the greeting party we were directed to our designated area, the T-zone. T stands for testosterone and because I brought some with me (Greg) we had to be segregated. 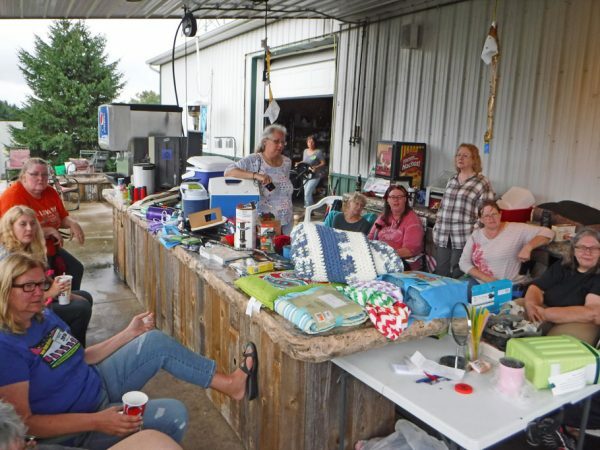 Honestly, I felt a bit off put by this rule – although I understand the desire for some women to be T-less and to have a women-only gathering, it leaves out women like me who have partnered up with some T and can’t really leave him behind. I knew about the T-zone ahead of time and imagined that it might actually be quite fun. I figured that we would be well away from the other campers in a secluded area. I thought it’d be a chance to get to know some other women who travel with their men. 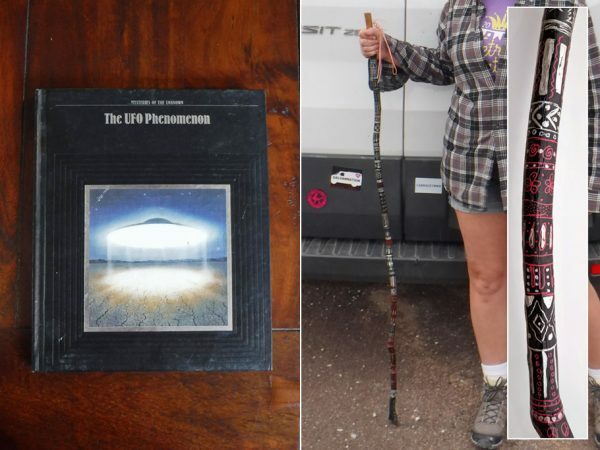 I decided that it would be the happening spot – that there would be music and that we’d all circle our vans around a communal campfire and that all the other women would gravitate over to our side in exile despite pitying us our burden of traveling with T.
Oddly enough it wasn’t like that. The T-zone was actually in the thick of things and every other camper had to pass by our vans to get to the central meeting place. The men (the 3 of them) were good, though, and mostly stayed in their rigs out of the way of the women. Ok – here is something you should know about me, I am terribly shy, introverted, and have social anxiety. I like having Greg around because he is friendly, congenial, and is generally not afraid to strike up a conversation with anyone. So it was hard for me that he couldn’t be my social sidekick, but it was really nice that we were close enough to the central meeting area that I could keep an eye on things, join in when I was up for it, and retreat to the van when I wasn’t. It may seem odd for someone who has social anxiety to want to drive to the middle of nowhere Ohio to meet a bunch of people she doesn’t know. But despite the anxiety part, I like to meeting other travelers and having a social circle of people with shared interest. Back in the boating world, it was a little bit easier, you sail up into an anchorage, drop the hook off some remote island, and it is likely that everyone around you is enjoying a similar lifestyle. Not so in the driving around camping world. Campgrounds are mostly full of weekenders. So where else does one go to find kindred spirits in the modern world? The internet, of course. I started reading online forums and eventually joined some van life Facebook groups. If you have ever been a part of an online group of people who have never met face to face, you know how contentious these groups can be. I think anyone who has shared on any type of social media knows how incredibly easy it is for people (even those you know in real life – friends and family) to be mean, hateful, and condescending. This is why one of my favorite FB groups has always been Women Who Sail. It isn’t that women can’t be mean, hateful, or condescending – they certainly can, but overall in my experience, they do tend to be kinder, more open, a lot more helpful, and more self-regulating. So when I got the inkling that there might be a van equivalent of WWS I went looking and found GVN. I would guess that most of the GVN women are going it alone. A lot of them are just getting started living full or part-time in their vans and despite having an online community to share with, I know they were super excited to meet other crazy van dwelling women like themselves in real life and expand their community of like-minded souls. The gloomy skies didn’t let up until we left (a day early and then the gloom followed us all the way back to Atlanta) which put a damper on the many planned activities, but there was still pizza night, free movies on the big screen with free popcorn, van tours, prizes, and much chatting and laughs at the central meeting area. I met a few really nice women and had the chance to invite many into the van and show them around (because I love showing the van off) but time didn’t really allow for any real bonding experiences for me. Still shortly after we returned from the meet-up at least a dozen new Facebook friend requests from women who were at the gathering rolled in. It is interesting to get to know people in this way – to see what they are interested in, to see what they post. I am trying to be less shy online, post more, and share more of myself. The virtual world is not a bad way to meet people when you are roaming around the vastness of the real world. * Click on pics to enlarge and open in a slideshow. The greeting party at the Camp-in. View from Ballena Blanca. You can see how close we were to the main meeting area/consessions stand under the awning. Like the ballfield Kevin Costner’s character built on his property in the 1989 movie “Field of Dreams”, owners of The Field of Dreams Drive-in turned a tract of land behind their home meant for crops into a destination to suspend reality just for a few hours. 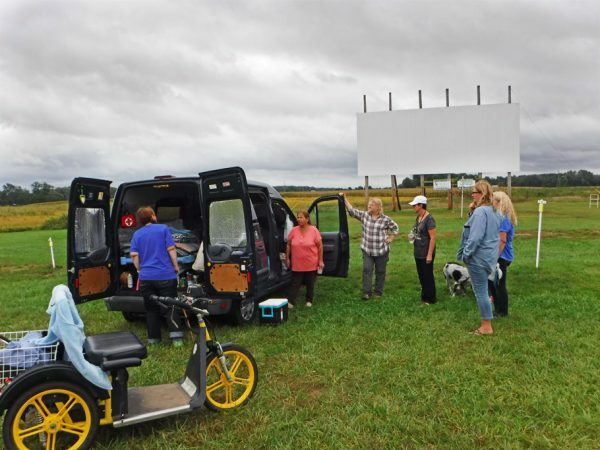 And just like Costner’s famous movie quote, “If you build it they will come,” moviegoers have come from all parts to this theater in the middle of farmland and cornfields. 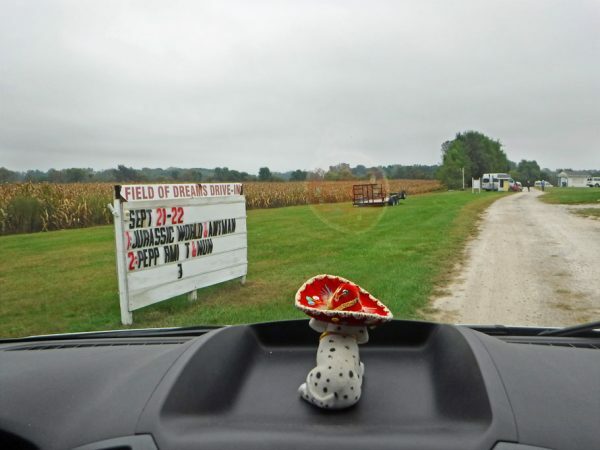 The owner told us that people travel to Field of Dreams from up to 70 or 75 miles as opposed to the norm of 40 or 45 miles for other drive-ins. But the GVN event has increased that radius a couple thousand miles to include almost every corner of the US and parts of Canada. Beyond the consession stand is a room for the Drive-in employees to lounge in when the movies run. 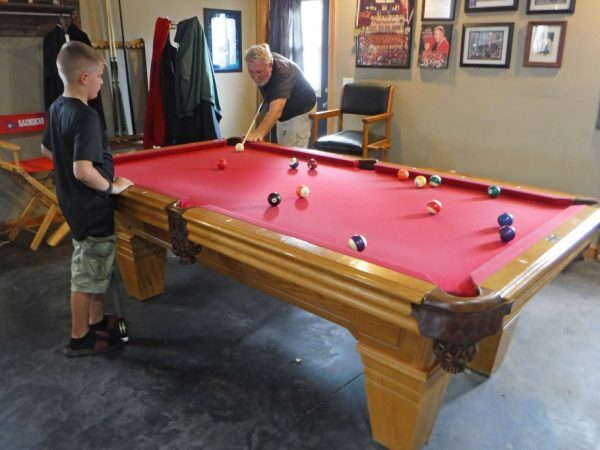 There are couches, a large video projector screen, a sterio, a dart board, and a pool table. Greg plays a game of pool with a neighbor kid who comes by to hang out in the rec room every day after school. The van tour. 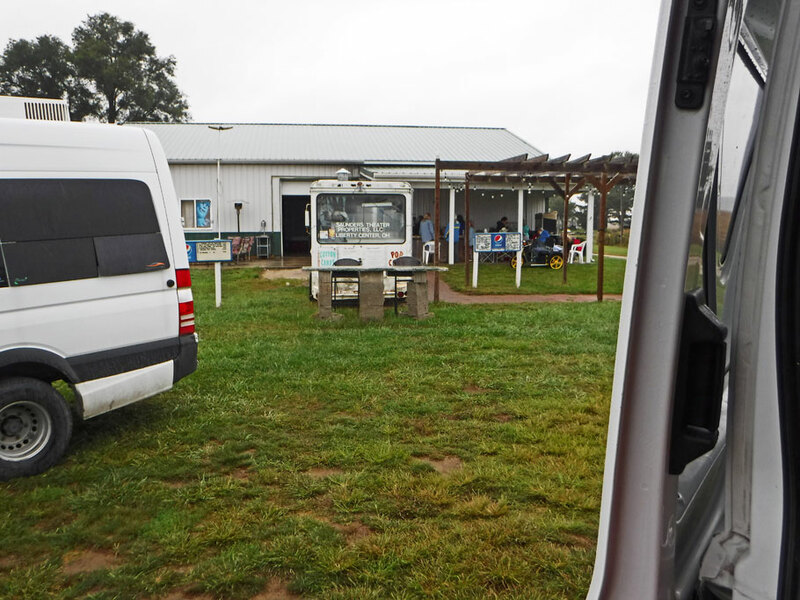 Although the grey skies put a bit of a damper on event activites, the van tour was still a go. I love the fact that Ballena Blanca is so accomondating. A few women stopped by during the van tour. The tour was a great learning experience for everyone as each women showed their own unique setup and fun gadgets that make their life easier when traveling around. Notice the scooter. Many of these women have unique challenges, especially with mobility, but that doesn’t hold them back. Sue keeps her scooter in her van but is planning on figuring out how to mount it to the rear so she can enjoy more living space. Erin and her husband both came in their own vans. Erin’s was the cuter one decorated with scenes from their life. Not all the women who attended the gathering are full time travelers. 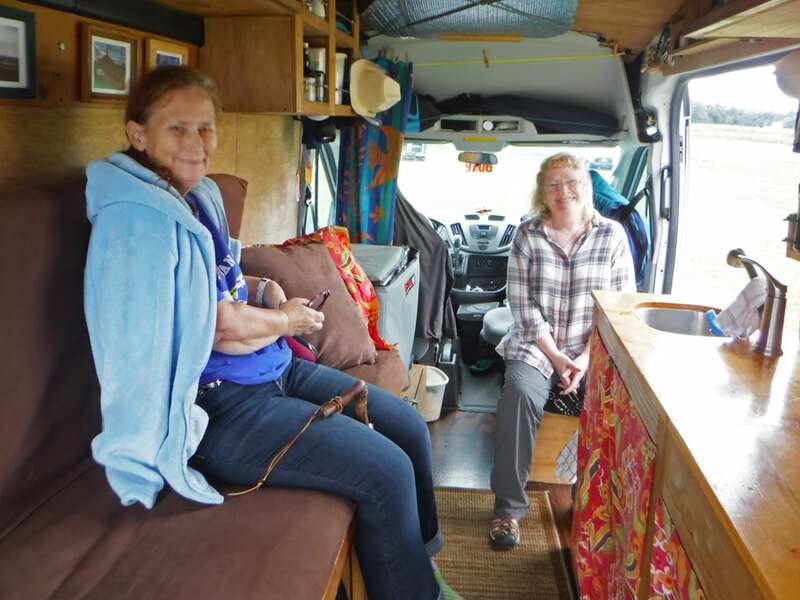 But as you can see this van piloted by self proclaimed “Two Wayward Women” have got their map very nearly filled in the two years or so they have been traveling. 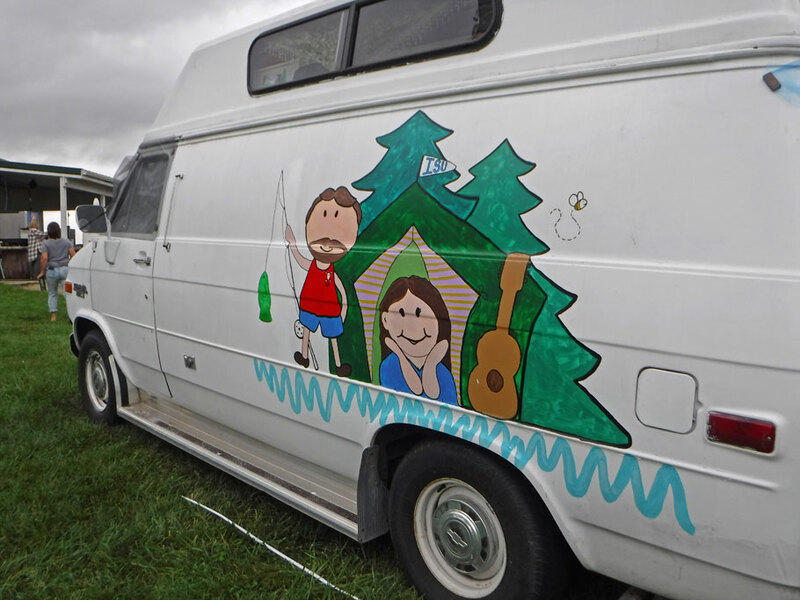 After the van tour there were awards, best van build 75% done by a woman, best exterior van decoration, longest van dweller, fatherest traveled to the event, etc. Each winner got their pick of prizes donated by the group. Once all the prizes were selected everyone was allowed to pick over what was left. A couple of the prize offerings for the awards ceremony. Although I wasn’t the longest full-time van dweller at the gathering I did win a prize for being the longest full-time nomad (7 years if you are curious). And, surprisingly, even though I wasn’t the first to pick a prize, I think I got the best prize on the pile. Can you guess which one I picked? And which one I picked out of the leftovers to give to a friend? There might have been as many dogs at the event as there were people. 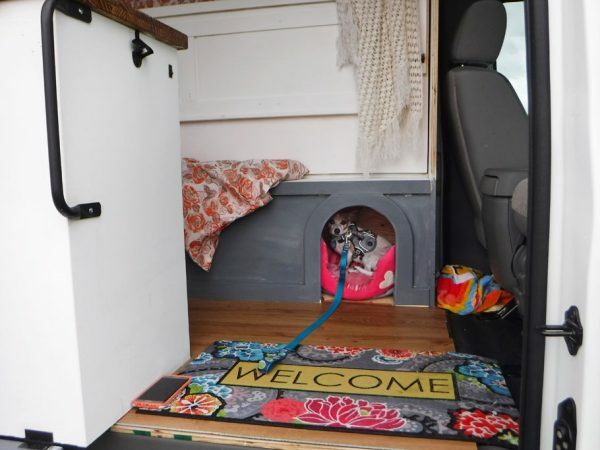 This lucky pup has his own built-in dog house! 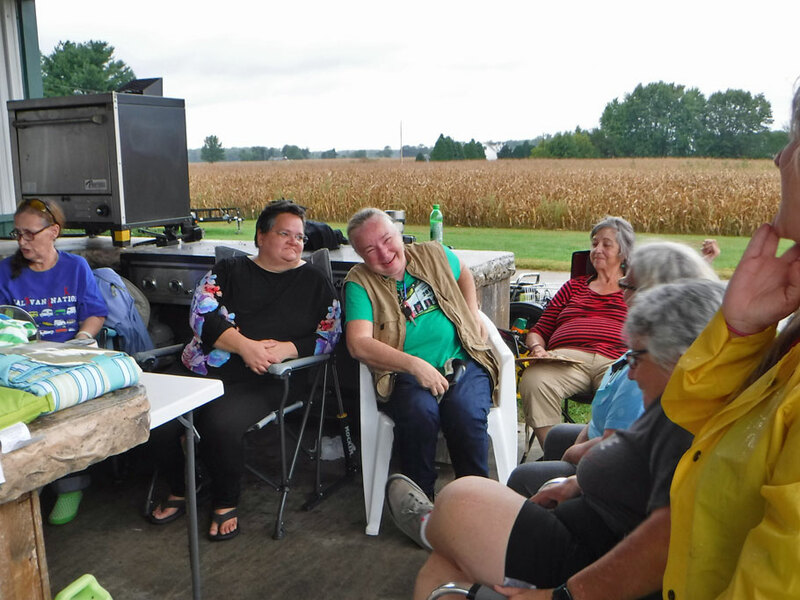 Marty (in the green shirt) keeps people in line on the Facebook group, but in person she is a real sweetheart. We were unable to see any of the movies listed on the theater’s marquee, but a few of the women went to Redbox and picked some flicks they thought everyone would enjoy. Well, except for Bob, who was very disappointed that we ended up watching Ocean’s 8 instead of Antman. Never-the-less we still had fun seeing a movie on the big screen from inside our home – and we were super close to the free popcorn at the concession stand. This entry was posted in Nomading, Ohio, Van Life and tagged Field of Dream Drive-in Theater, Liberty Center Ohio, van gathering, van life, van meet up, Van tour, women vanners. Bookmark the permalink. Great job ! …. was a pleasure meeting you ! Thanks! It was great meeting you too! Great recap!! 🙂 Wonderful seeing you both again and the changes to your home. Hope to see you out there again one day!! Thanks Tina! I bet we will cross paths again someday! Duwan, thanks for the great write up about the GVN Ohio Gathering. But you made one mistake, you said you got the best gift off the table. WRONG because I did, my electric water pump. Thank you two so much, never dreamed I would have running water in my van. Thanks for sharing all the pictures and didn’t realize he took a pic of you and I in your van. Loved the tour and all the tips you two shared with me. Yes – I almost mentioned how happy you were to get our spare water pump from our boat. I thought the pump was a pretty good prize too! So glad I didn’t sell it before the meet up and you got it! That book looks familiar 🙂 Meeting people online can be a great way to connect with super cool people. After all, that’s how I found you! Yes — so glad I started reading your blog just as you started work on your boat in Indiantown – a coincidence of time, place, and the internet! I’d call this an interesting gathering. I’ve never been to a van gathering, but I totally get the difference between cruisers and vanners, a difference we have experienced when meeting other Westy owners. There are only about 200 of our imported vans in this country, so it’s fascinating to meet other owners. 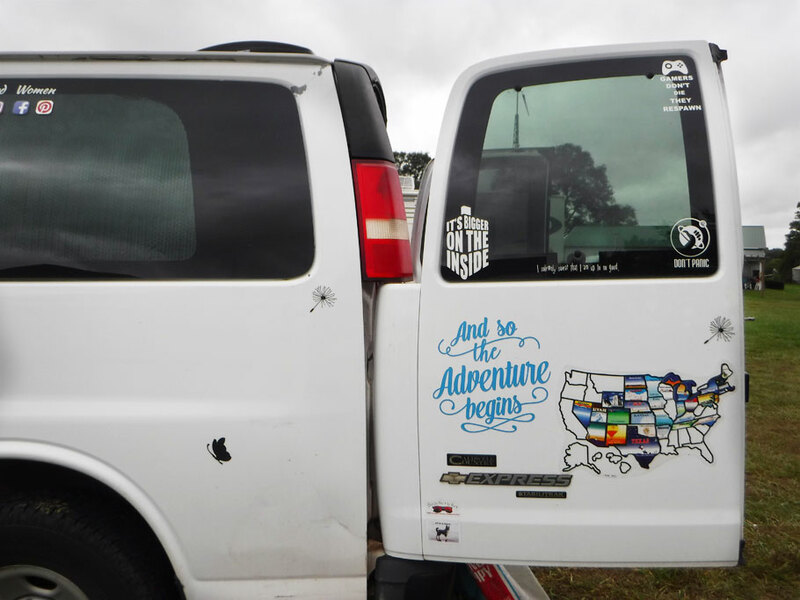 Yet, the only thing we usually seem to have in common is the van…. Very different in the sailing world. I like having a Facebook group that I really participate in. I am mostly a lurker. But it is hard finding the right van group fit. I wish there was a group for nomadic women who travel with their partners in small vehicles and love adventure and boondocking. But since I have no desire to be an admin of such a group, I guess I’ll just keep searching for the exact right group. Oh – you need to go to a drive-in. Not sure if they would allow hightop vehicles in drive-ins, but when we had our VW Westy we took it once and it was fun. So cool to take your whole house to the movies. I love showing off our van too. Every once in a while I will read a post on one of my van groups about someone complaining because people ask to see their van. I get that it is their home, but I always liked showing off my home even when it didn’t move.